Much to my dismay, I feel like death warmed over today. So I’m going to go curl up in bed around a bottle of Pepto Bismol and try desperately not to even think about food. For those not laid low by illness, I would highly recommend the Gastro Obscura (the food section of Atlas Obscura), which I have been greatly enjoying perusing lately. For example, there’s a great article on narutomaki, which is a type of Japanese fishcake that you may have seen floating on top of the last soup in my fast food ramen entry. 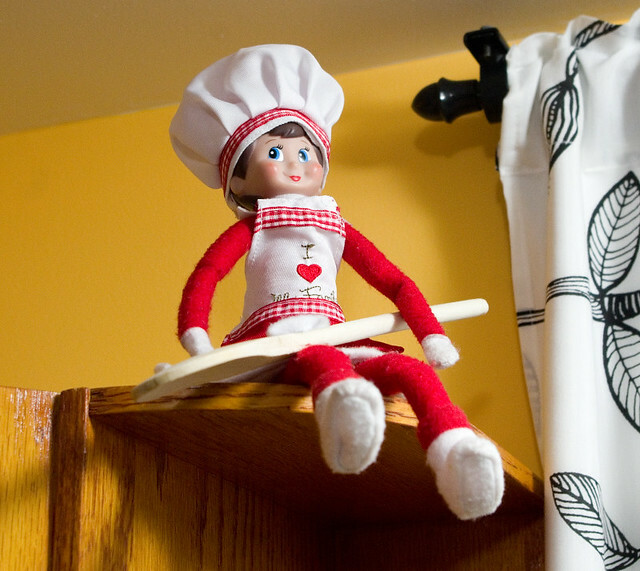 For today, please enjoy this photo of our Elf on the Shelf Candy Cane perched atop my kitchen cupboards, “helping” me cook. Hopefully I will be well enough to write properly tomorrow. Posted on December 20, 2017 December 20, 2017 by owntwohandsblogPosted in Holidays, HomeTagged food, holiday, Holidays, sickness, traditions.